Making a stuffed teddy bear is quite an interesting process. Ms. Teddy Bear doesn’t make our own teddy bears, but but we thought our customers might be interested in exactly how our bears are made. The process starts with designing what the bear will look like. Then raw materials are collected. These materials will be assembled during the manufacturing process. After the bear is made, it is inspected and if the bear has met specific requirements, it will end up at a distributor like Ms. Teddy Bear. Following is a description of how a teddy bear is created, from inception to completion. The designer starts by asking questions like, will the bear be seated or standing? Should the bear have long legs and arms or will its extremities be short and squat? What color hair will the bear have? Will the color be Blonde or brown? Grey or black? Will the bear have sewn in eyes that are embroidered? Or, will the bear use pre-made eyes and what material will those eyes be made from? Once the designer has an idea of what they want the bear to look like, they make a sketch of the bear, either by hand or on a computer. With the design finished, a pattern is made. The pattern is a series of shapes that will eventually be sewn together using industrial sewing machines. Generally, each worker is assigned a particular type of teddy bear to create. In this manner, each sewer becomes quite skilled at assembling a specific style of bear in an efficient and timely manner. With the bear sewn together, it is then stuffed with some type of fiber. Today, the most often used fiber is made from polyester. The fiber is tightly packed into the sewn bear. How tightly it is packed translates to the overall firmness of the finished product. At the end of the process a “finisher” then sews up the remaining hole and the bear is then sent to Quality Control. An important step in the manufacturing process is the visual inspection of each bear. Skilled workers guarantee that all bears have been assembled correctly and are an exact replication of the teddy bear initially created by the designer. If any bears are found that do not meet the strict manufacturing or design standards, those bears are destroyed and never make it to store shelves. When the teddy bear has been verified as correctly assembled, it is then packaged with other bears for shipment. Those bears are then shipped to Ms. Teddy Bear and put on our website. 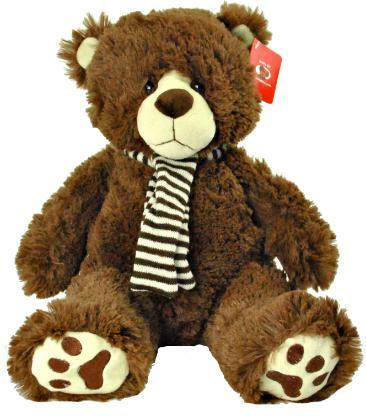 Ms. Teddy Bear sells our bears to wholesalers, retailers and the general public. We hope you’ve enjoyed getting a better understanding of how our bears are constructed. If you have any questions or comments for us, we are available M-F at 800-562-1688. These teddy bears look adorable. I have a business and travel to different event locations, such as craft fairs, county fairs, and numerous other events. I was wondering if I could get more information about them and the cost of them. Sure, we’d be happy to provide you with more information. Please send an email to: sales@msteddybear.com and we can get you additional information. Thanks so much! If there is a particular style you’re looking for – please let us know at: sales@msteddybear.com and we’ll be sure to get one out to you right away. Have a great day!